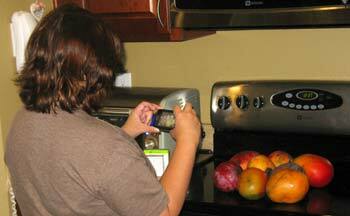 Kattia documents the arrival of Redland mangoes. A person can move away from Miami but their craving for flavors of the place will stay for a long time. Case in point, friends Kattia and Chris moved away about 10 years ago, and live in tropical fruit exile all the way up in Sanford. If they want a fresh mango, they have to go to the store and settle for fruit imported from Mexico. They complained those out-of-season offshore mangoes just don’t have the flavor, juiciness and aroma of a home grown mango from Miami. And why should they? Imported fruit is picked half-ripe, then dunked in hot water to kill pathogens, which also kills taste. I told my friends about the bumper crop we had this summer, and they asked when I was coming up. Right away, I replied, and loaded up my car with sacks of plump red and golden Kent mangoes from Paradise Farm, and headed north on I-95. About four hours later, I pulled into their driveway, and Kattia and I lugged eight pounds of mangoes and a box full of empty canning jars to her kitchen. “When life hands you mangos, make jam!” said Kattia with delight. (If this sounds like a familiar adventure, she and I made lychee freezer jam two summers ago.) The canning process she followed wasn’t all that difficult, even for a novice like me. “The trick to making cooked jam is to have everything ready and waiting to go,” she said. As the dishwasher hummed, we peeled, seeded and chopped mangoes. Six cups of fruit were destined for jam, and went into a big pot to cook. (The rest of the fruit was stuffed into the freezer.) Lemon juice was added “to wake up the taste of mangoes,” and pectin was stirred in. “Pectin is what makes the jam set,” Kattia explained. 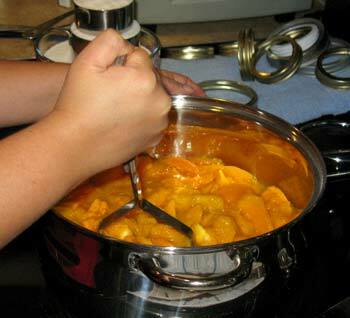 “Pectin and lemon help mangoes give off juice.” She also added a bit of butter to reduce foaming as the mixture cooked. Mashing chopped mango as it cooks. Note 5 and a half cups of sugar, and rings in the background, ready to go. 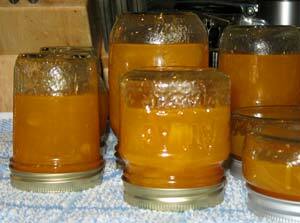 When the mango mixture got soupy and looked translucent, it was time to fill up jars. “It helps to lay out everything you need because assembly goes quickly,” Kattia said. She set a wide mouth funnel into a jar, and ladled mango mixture up to the very neck. Next, using a magnetic grabber, she fished a lid out from a small pot of simmering water, centered it on top of the jar, and screwed on a ring. The filled, sealed jar was then turned upside down on a towel on the counter. Jam cooling upside down. When a jar is flipped over, the air inside will rise to the top and create a vacuum. The jars stayed upside down until they were cool to the touch. This took about an hour or so. Then we turned them right side up and tested the seal. A properly sealed jar lid was hard, without any give. Two jars had lids that popped or flexed a little, and they went back upside down for about 15 minutes longer. (If that still didn’t do the trick, the jam would have to be eaten right away — what a tragedy! — or processed in a pot of boiling water for long term keeping.) The whole process took about two hours, including prep and filling jars. Voila! We had jam! It wasn’t that difficult to make. The hardest part, and it’s not really that hard, is to track down canning supplies. Kattia bought jars, lids and canning paraphernalia at a nearby Super Wal-Mart. If your local store doesn’t carry what you need, you can find canning kits and jars online. Labels would be helpful if you’re making a batch to give away. When we were done, pretty golden jars of mango jam were lined up on Kattia’s counter. The sweet tropical taste of Miami’s summer had been captured to savor for later. (It’s not the same as having fresh mangoes, but the stash in the freezer comes close.) I drove back home with several jars, some to keep and some to share. My jar is meant for for medicinal purposes, as it were, for later in the year. A bit of sunshiney mango jam spread on buttered toast will chase away any gray winter blahs! Peel, seed and chop mangoes. Put them into a large pot with lemon juice and mash with a potato masher. Stir in butter and pectin and keep stirring. Raise heat to a boil. Skim off any foam. Then quickly stir in the sugar a bit at a time until it dissolves. Keep stirring at a rolling boil for 1 minute longer. When the mixture looks transparent, it is ready to put into jars. Ladle mango mixture into a jar up to its neck. Do not overfill, as you need an air space. Wipe off any spills and put on the lid and ring. Place jar upside down on towel to cool. Repeat with other jars until all your mixture is used up. Let jars cool to touch, then turn over and test seal. If the lid pops, flip it over to sit for a few more minutes, or refrigerate.